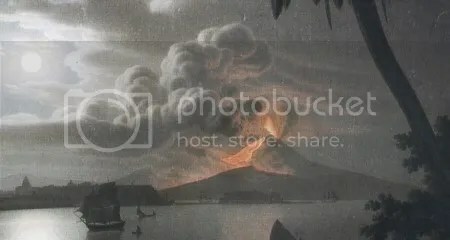 Posted by admin in Saturday volcano art, volcano art, volcano culture, volcano images. Although this picture was painted in 1797, it depicts an eruption that took place some ten years earlier, in the summer of 1787. The painter was Giovanni Battista Lusieri, who was born in Rome around 1755 and from around 1782 worked as a painter of local views in Naples, producing pictures of the city and its picturesque surroundings – including Mount Vesuvius, then very active – for travellers visiting Naples on the ‘Grand Tour’. Demand for Lusieri’s work was such that he produced multiple copies of some of his most popular images by printing outline etchings of them which he then coloured by hand. This view of Vesuvius in eruption was painted using Lusieri’s characteristic technique of watercolour washes, with ink used for outlines and some detailed modelling, producing an image of precision and delicacy. He was dedicated to accuracy, spending long hours perfecting his images, and insisted on the primacy of nature over the artist’s imagination in art: ‘one should faithfully imitate nature’. This view of the volcano erupting in the moonlight, its orange lava contrasting with the silver sky and the tranquil waters of the bay, nonetheless has a powerfully romantic atmosphere. From 1799 Lusieri worked as an agent for Lord Elgin, overseeing Elgin’s programme of acquisitions of art and antiquities in Greece from 1801 onwards, including the removal of the Parthenon sculptures now known as the Elgin Marbles. Lusieri died in Athens in 1821, lamenting that his work for Elgin had prevented him from devoting himself to his art. 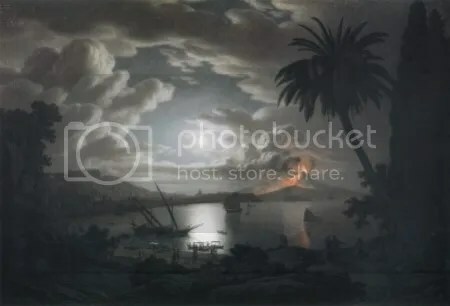 Further disappointment was in store, had he lived to see it: a ship carrying the majority of his watercolours sank in 1828, leaving little of his work for the appreciation of posterity. Giovanni Battista Lusieri – biography from the Getty Museum, Los Angeles. Giovanni Battista Lusieri – another biography, from the National Galleries of Scotland. Vedutismo e Grand Tour – complete text in Italian of Fabrizia Lucilla Spirito, Vedutismo e Grand Tour: Giovan Battista Lusieri e i suoi contemporanei (doctoral thesis, Università degli Studi di Napoli Federico II, 2006); link is to a page from which the PDF can be downloaded. Vesuvius on the Grand Tour – volcanic tourism in the eighteenth century, from the Georgian Index.